Last week I described the almost overwhelmingly different symptoms histamine reactions can trigger. It was truly an awesome list. To some of you, perhaps, a depressing look at your body’s natural chemistry. However, there are times where histamines have good attributes. If you are getting the idea that histamines do more than just give you watery eyes, runny noses, or hives—you’re right. Histamines commonly cause blood vessels to swell (dilation, if you want to get technical). This means that your white blood cells can quickly find an infection or problem in your body. They act just like the streaking light of a flare shot into the sky can help searchers find whoever sent up the flare. Unfortunately, it is also the histamine build-up that gives you a headache or stomach problems or makes you itchy or stuffy or achy or anxious or dizzy or nauseous or just plain miserable. On the one hand, we know histamines trigger a lot of our problems. On the other hand, they trigger the symptoms that are like the warning light in our car. Just like that light, they let us know we’ve got a situation we need to take care of. Ignore the warning light in your car by putting tape over it so you can’t see it, and you’re asking for car trouble in the future. Consequently, ignoring your symptoms by taking medications to temporarily relieve them, is like asking for more health trouble in the future. Furthermore, we encourage people to get their allergies and sensitivities treated before they become overwhelming. Our treatments are the most gentle, painless, and effective you can experience. Your motto should be, “Heed your histamines, heal your health”. In Part Three of this series, I’ll talk about what foods cause high histamine levels in the natural chemistry of the body. We’ll also discuss how and why those foods can make your seasonal allergies worse. However, getting treated for the pollens, animals, and fragrances sensitives may not be enough in the long-term. And who wants to feel miserable—again and again? 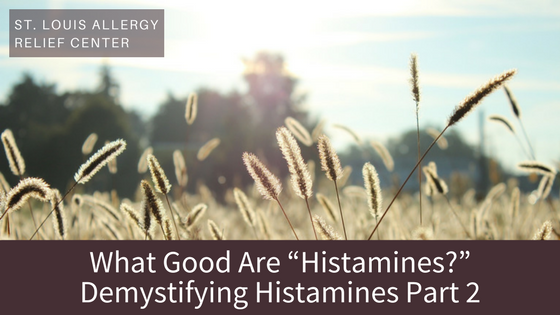 Make sure you continue to follow along with this series for more on histamines! Want to learn more about histamines and how they are affecting your daily life? Contact Dr. Ian Wahl at St. Louis Allergy relief for more information!